For outdoor cooling, fog effects, odor and dust control, consider installing a misting system from Hotsy Industrial Systems. We specialize in custom design systems and have installed numerous misting systems in restaurants, resorts and residences in Tucson and southern Arizona for over 14 years. Misting systems provide water droplets that are smaller than a human hair. Millions of these tiny droplets hit the surrounding air, flash evaporate, and quickly reduce the temperatures up to 25 degrees. 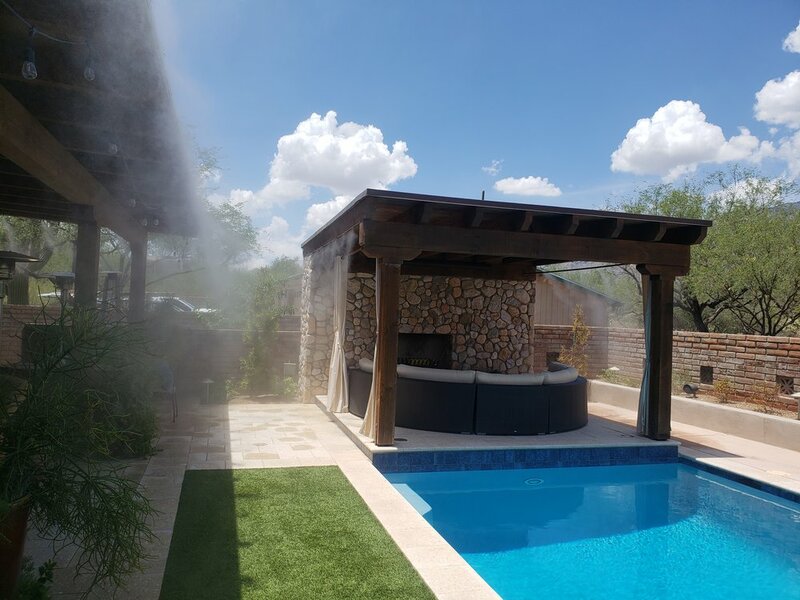 With the Arizona summers, misting systems provide much needed relief for patios, terraces, break areas, schools, play grounds, work bays, kennels, and much more. Our misting systems consist of stainless steel tubing, high pressure fittings, water filtration and high pressure pump modules designed to provide many years of dependable service. The stainless steel misting lines come with a life time warranty, while the high pressure pump, motor and installation come with a one year warranty. We have trained technicians who provide prompt, friendly service when needed. Consider a misting system from Hotsy Industrial Systems. We would be happy to provide an on-site analysis and quote. We are located in Tucson – call (520) 790-7120 for more information.